Some years ago, my wife and I shared a perfect mango in the south of France. We peeled its leathery skin with a pocket knife and sliced into peach-like flesh. As we gobbled strips of the heady fruit a crowd of dark-eyed children formed around us, giggling at the sight we made. Before long, as fragrant mango juice bubbled onto our hands and ran in sticky rivulets down our chins, we were giggling too. At that moment we were in complete agreement with Tom Stobart, who once said that after eating a really good mango you need to take a bath. Make the spice bag: Over the years I’ve tried a variety of bag-like things for steeping the spices in mango chutney, from sewn muslin bags to cut off, out-of-fashion tube socks. What I’ve found works best is either an ankle-high stocking or nylon footie. Put all the spices, onion pieces, garlic and ginger into the bag, and close it up tightly with a twist tie or some string. 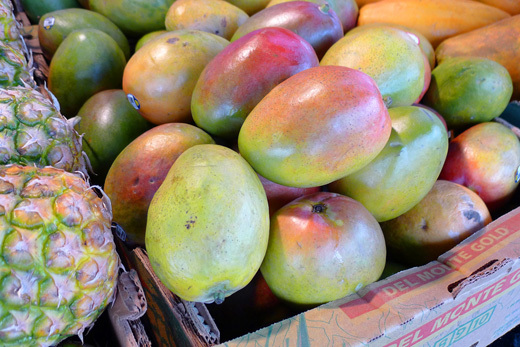 Peel and slice the mangoes: Choose mangoes that are yellow to red in color but still firm. Cut two big halves out of each mango by working around the perimeter with a paring knife, keeping the blade thrust in against the stone’s flat side as you go. If all goes right, you’ll end up with two fleshy halves and a big flat seed. Peel each half with the knife and cut the flesh into flat chunks an inch or so long. Cut any flesh left against the seed into pieces as well. Weigh the mango bits before you add them to the pot. The recipe is based on 22 ounces of mango. If you’re off significantly, either slice more mango or adjust the sugar and vinegar accordingly. 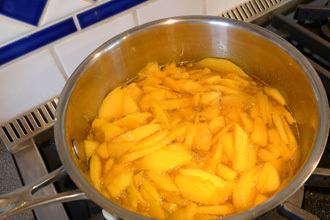 Make the chutney: Put 2 tablespoons of water, 2 tablespoons of salt and the peeled mango bits into a large saucepan. Bring to a simmer over medium heat, stirring constantly. Add the sugar and, when melted and hot, add the spice bag. Keep stirring. Now add the vinegar, lower the heat to medium-low and keep the chutney at a simmer for 20 minutes, stirring occasionally. Every 5 minutes or so flatten the spice bag with a wooden spoon to squeeze out the flavor. After 20 minutes, remove the spice bag. Keep the pan at a simmer for a few more minutes until the jars are ready. If desired, you can add ½ teaspoon each of Fruit Fresh (ascorbic acid) and turmeric at this point to brighten and stabilize the color of your chutney. Can the chutney: Bring a large pot of water to the boil and put 5 clean half-pint canning jars into it. Boil for 10 minutes and set the jars upside-down on a clean cloth or paper towel until ready to use. Put a pint of hot water into a bowl and keep the lids (not the rings) in it until ready to use. Turn the jars right-side-up and fill with hot chutney, leaving ¼” of head space. Adjust the lids, screw the rings down until the lids are just seated, and process for 15 minutes in boiling water. For more on canning, see the Ball Blue Book. 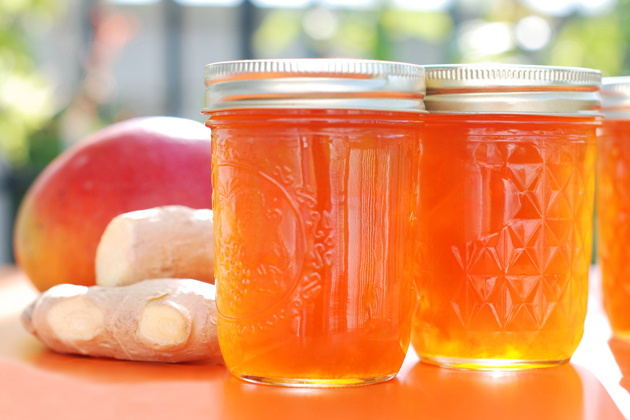 You can enjoy your homemade mango chutney any time of the year. It’s great with everything from Indian food to tuna fish sandwiches. Go on, be inventive. My friend Judy’s baked brie smothered with mango chutney is always the hit of the party. Yum! I love mango chutney. I mix it in my turkey burgers before I grill them it adds great flavor. Also good with just crackers. I bet this is exquisite! It’s got to be heads and tails above the grocery store stuff! This looks great. I love mango chutney. 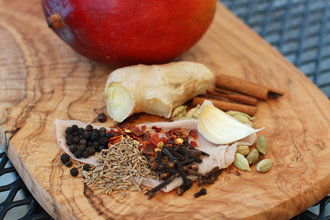 Do you have any tips for making a “hot” mango chutney? I’ve never made the hot version – what in Britain they call ‘Mango Pickle,’ mainly because of how much salt is involved. According to Tom Stobart, you use green mangoes for this. For each kilo of sliced mango, slake with 9 ounces of salt and stand them in the sun for a few days. After this, add 1 ounce each of ground fenugreek, nigella seed, turmeric, aniseseed, black pepper and chili to taste and then mix with mustard oil before bottling. For once, I’ll stick to the prepared mixture, since a small amount goes a long way and it lasts forever in the fridge! I haven’t seen this in my grocery store, but I can only imagine what the jar would taste like. This looks amazing! This does sound amazing Don. My mind is racing with all of the things I could use it for. Oh, how we love mangoes!! And a good chutney recipe is alway something one should have on hand. I have to admit that I’ve never actually made chutney before, but I use it frequently. I think I’ll need to give it a go! Love the colour of your chutney! The way the light catches it in the first photo is just breathtaking, especially since most mango chutneys I’ve seen are more of a dark brown colour. Just lovely. WOW! Mango is one of my favs. Never tried making chutney but this one is worth a shot.Good stuff! Oooo, goody! I was hoping that you’d post this after you mentioned it at the wine tasting. My question (albeit from a non-canning person) is: could I make this up and FREEZE it (instead of canning) like I do with freezer jam? Freezer jam has a bit more sugar to give extra body to the jam when it’s thawed, so that the fruit doesn’t separate. Obviously the finished chutney will be sweeter, but you can add up to another cup of sugar to this recipe and still have excellent results. Go for it! I love the use of the muslin spice bag here; I usually do rustic chutneys with fresh-ground spices, but I really love the look of your de-spiced chutney in its jars. Gorgeous and yummy-looking! I’ve never had mango chutney, but I bet this is crazy delicious!! That photo of the jars… I wish that I could pick it off my screen. Beautiful recipe! This looks like something I really want to make…I would love this with organic corn chips! That sounds wonderful. I have made jellies for cakes and pastries, but never to keep jarred. I will have to try this, I looooove mangoes. Spreading them on toast in the morning would be awesome! spicy and sweet! Sounds (and looks) delicious! My friend just gave me a jar of chutney she brought back from London. I have yet to use it with some dishes. Love the photo of your chutney. Would it be okay if I used less sugar or would that interfere with the setting of the chutney? Our family isn’t really a big fan of sweet things and I think a cup and a half would do for us. That mango chutney has an amazing colour! How hard he tried to make expedition food better! I was pretty excited to try this but is the 2 tbsp of salt correct? My batch tasted a little too salty for me. I have made this recipe a number of times now. I keep having to make more as my mother loves it so much that it just disappears. I use it as a base for marinades as well. Just brilliant.